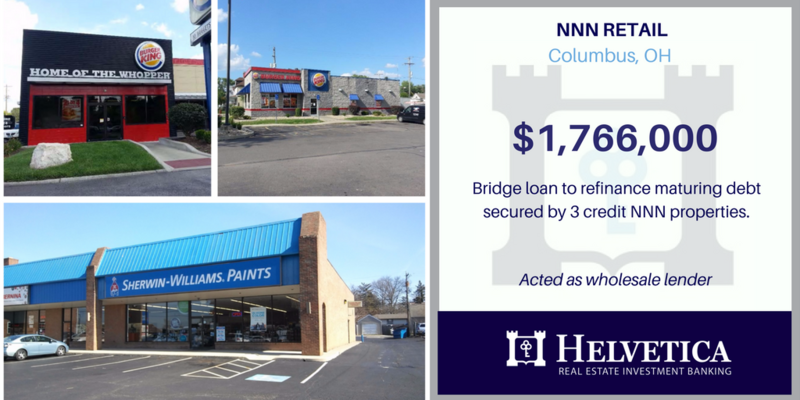 COLUMBUS, OH - Helvetica funded another broker originated $1,766,000 bridge loan to refinance and consolidate maturing debt on three NNN retail buildings with complex title issues. The subject collateral consisted of two Burger King restaurants and one two-tenant retail building which featured Sherwin Williams as the anchor tenant. One of the properties had an easement issue which needed to be resolved before the loan could fund. Through great coordination between the broker, and borrower's counsel, Helvetica helped navigate the title issues in order to payoff the looming balloon payment. Helvetica provided $1,766,000 in bridge financing to pay off the current debt and give the borrower time to refinance into more permanent financing.